Super Troopers 2 was finally released today, but the Broken Lizard crew already have an idea for Super Troopers 3, and it involves the Marvel Cinematic Universe. It's been 16 years since talk about a sequel to Super Troopers was first mentioned, and now the movie is in theaters, taking aim at the number one spot at the box office. Additionally, Super Troopers 2 has been getting good reviews, which has surprised some fans. But, the victory lap is going to be short-lived at the box office since Infinity War hits theaters next weekend. Speaking of Infinity War, the Broken Lizard team have an idea for Super Troopers 3 that involves Captain America and Bucky. The crew have been toying with naming the next movie Super Troopers 3: Winter Soldiers, which is a pretty epic idea. In fact, Broken Lizard has even talked about Chris Evans joining the team, if only for the fact that he's sporting some facial hair now. Jay Chandrasekhar had this to say. "Well we've talked about Super Troopers 3 being called Super Troopers 3: Winter Soldiers. Since Chris Evans is retiring as Captain America, and he already has the mustache." 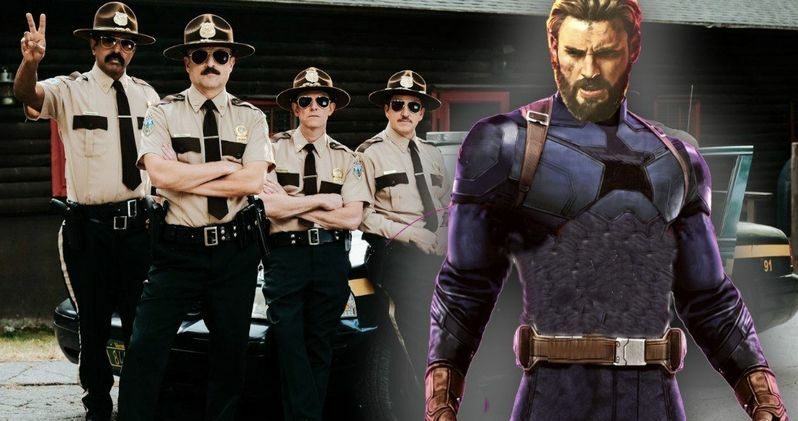 The Broken Lizard crew are joking about the idea of the MCU crossover, but they seem to be pretty serious about the title being Super Troopers 3: Winter Soldiers. Chris Evans could end up making a cameo as long as it doesn't take them 16 years to make a sequel again. Evans seems like he has the sense of humor that would work well with the Broken Lizard guys, but Marvel Studios probably wouldn't be super into the idea of the new title for obvious reasons. While out promoting Super Troopers 2, the creators also joked about the third movie including all kinds of iconic villains from various franchises, including DC comics as well as the Star Wars universe. The guys talked about the Super Troopers going after Jabba the Hutt as well as hunting down Jack Nicholson's version of the Joker. The Broken Lizard crew think they could use Captain America's help to get those supervillains but admit that they'd have to watch their language around him. Super Troopers is now finally in theaters after completing the second most successful crowd funding for a movie in history. The initial goal was $2 million, which made Broken Lizard pretty scared. However, their fears were quickly laid to rest when they made their goal in less than 24 hours, going on to more than double the total that they needed. Now, the movie is out in theaters and set to debut at number one. So, who knows, maybe the talks about Super Troopers 3: Winter Soldiers isn't so far-fetched after all. You can read the rest of the interview with the Broken Lizard crew over at CinemaBlend.